My husband and I were both teachers, (Rob Art; Joan Geography) and wanted a career change. We looked at several ideas, including running art courses. We started to look for a suitable property to use, and had several hotel details sent to us. It seemed sensible to look at a hotel, and run art courses from it. It took several years to find the right property, and we knew the instant we saw Ynys Hir it was ‘the one’ but had a long struggle to buy it, and an even greater challenge to bring it back to life. We were completely green when we came, couldn’t even work an optic! But ‘in at the deep end’ we had to make it work. On the second day, Chef said it was his day off the next day, so I had to roll up my sleeves and cook a menu! (This was 1989, so cooking wasn’t quite the same as today!) We worked our socks off, and realised that the hotel trade was so all involving and interesting, that we didn’t really need to run the Art courses. We did them for a couple of years and then just concentrated on the Hotel. Part of the success was looking at the business from a customer’s viewpoint, putting them first. The rest was sheer hard work and determination. Tell us about Ynyshir Hall Hotel. What inspired the initial idea and what is your future vision for the hotel? As we said, our initial idea was to run art courses, but this didn’t last long. We realised that a small hotel in an historic building with a very large garden had to aim at a high end market to be viable. We have always been perfectionists and wanted to create a place where the atmosphere was warm and friendly, but the service was professional and food was wonderful. The setting is enchanting, and we had to work hard to bring the gardens back to their former glory. The place is a real haven of peace. We worked on the rooms, initially Rob doing a lot of the decorating with our handyman, and I made all the soft furnishings. But over the years we have brought in local craftsmen, but always kept close control of every aspect of the design, including menu covers, website and all marketing material. Consequentially, the place has cohesion, as one inspector put it, ‘It all beats with the same drum’. Being small, we can offer a very personal service. Guests feel very much as they are staying with friends. In a World which is so fast paced, people love to just escape to our tranquil haven. What strategic partnerships/marketing strategies have you implemented that have attributed to Ynyshir Hall Hotel’s success? Things have changed dramatically over the last 26 years! But some strategies have been constant, as they work for us. We have rarely used advertising, but we always welcome journalists. Luckily we have had many positive articles over the years. Now we have our own PR Agent, Peter da Silva, who manages this for us, very well indeed! We relied on getting into the ‘free’ guides like the Good Food Guide and the Good Hotel Guide. Of course being in the Michelin Guide has always been very important too. As one cannot pay for inclusion of these guides, we just simply tried to be the best at what we do, working very hard at it and always being here! Cream should rise to the top. We have continued to pay to be in the AA Guide throughout all our time at Ynyshir, as this also provides a benchmark for our food. We applied to Relais & Chateaux after working towards this goal for 10 years, and were delighted to be accepted in 2001. This still is a major contributor to our business. Relais & Chateaux has a very loyal following, and the guests who come through this channel do really appreciate what we do. Over the past few years we have concentrated a lot of effort on our internet marketing. Our new website is constantly being adapted and updated. We changed our PMS System last year, to allow us to link both with our website booking system, and link to SynXis. We have devised a flexible rate system with a built in yield management, and we ensure rate parity across all booking engines. We find that so many people simply use search engines to find a hotel, so we work hard on website optimisation and Google Ad words. We have a Twitter account and are working on our Facebook account too, but there are only so many hours in a day! It’s very interesting that sustainability, food miles, and foraging are real buzzwords at the moment. Being located midst some of the most unpolluted countryside in the World, (it is a UNESCO Biosphere Reserve) we have always grown our own food, foraged for wild food and used our wonderful local suppliers for all our 26 years. But now we do emphasise this and tell people exactly what we do! We have just re built our kitchens and now we have space to do ‘kitchen experience’ days and we have a wonderful Chef’s table, which is very much in the centre of the action. The notion that all hotels should have Spas has waned over the past few years, but so many guests do now look for treatments. We have converted part of our outbuildings into two beautiful treatment rooms and we employ a fantastic therapist, who does Massage, Bio Energy Healing and Mindfulness walks. Our wonderfully peaceful location lends itself to Holistic therapies and we find they fulfil a real need for today’s guests. We Love our guests! All of them….. Your greatest success as owner of Ynyshir Hall Hotel? Most difficult moment- how did you overcome and what did you learn? Difficult to single out the greatest moments! But winning the ‘Catey ‘Award for ‘Best Independent Hotel’ was a complete surprise and an amazing accolade to get from the Trade itself. We also won our first Michelin Star, 4 AA Rosettes and got accepted into the Relais & Chateaux family all in the same year as the Catey, 2002. Coming after the dreadful year of the foot and mouth epidemic in 2001, proved how volatile this trade is! The most difficult time was the year when the von Essen group went into administration. Andrew Davis had taken a while to persuade us to sell Ynyshir to him, but he promised to finance a refurbishment and expansion plan, and keep me on as General Manager to oversee this. It did seem a great opportunity at the time, as we knew we needed to put in a large cash injection to take us on to another level. However, there was virtually no investment in the Hotel despite many plans being drawn. We sold in 2006, and the company Head Office was put into administration in April 2011. The prospect of losing control of my beloved Ynyshir, and most likely seeing it fall into disrepair and decline was heart-breaking. Having to show round prospective buyers and see the valuer rummaging through all my personal possessions and treasures was dreadful. I did spend some time crying at the bottom of our lovely garden! My staff dwindled, as the whole kitchen team left, my Assistant manager, Receptionist , and Head Waiter, all left on the same day 31st July. Then we had the busiest August ever! And a Relais & Chateaux inspection. Luckily my core of loyal staff remained, and I filled in all the gaps and had relief chefs running the kitchen. We were asked about buying Ynyshir back, which we thought was impossible. But I was just determined to do it. We met with Barclays Bank, and negotiated with the Administrators, and with help from good friends, who were former guests, who are now our financial partners, we managed to once again become owners. The sale went through in January 2012, since when we have made huge investments and brought Ynyshir back better than ever- as the list of Awards we have won since prove! To run a hotel isn’t a ‘job’ it’s a lifestyle, especially a small hotel. It isn’t glamorous; it’s very hard work, often tedious and always relentless. Remember all your busiest times are when everyone is out enjoying themselves. But it is the most rewarding occupation, and you meet amazing people. Choose the hotel with great care, deciding what style of business you want and exactly what your target market will be. Make sure you have a trial run, work in the business to see the reality. Take as much advice as you can, look carefully at your margins, keep up to date with the law! Describe the ideal experience at Ynyshir Hall Hotel. The journey here is important, enjoy the scenery, and allow plenty of time. Stay for a long weekend, at least! 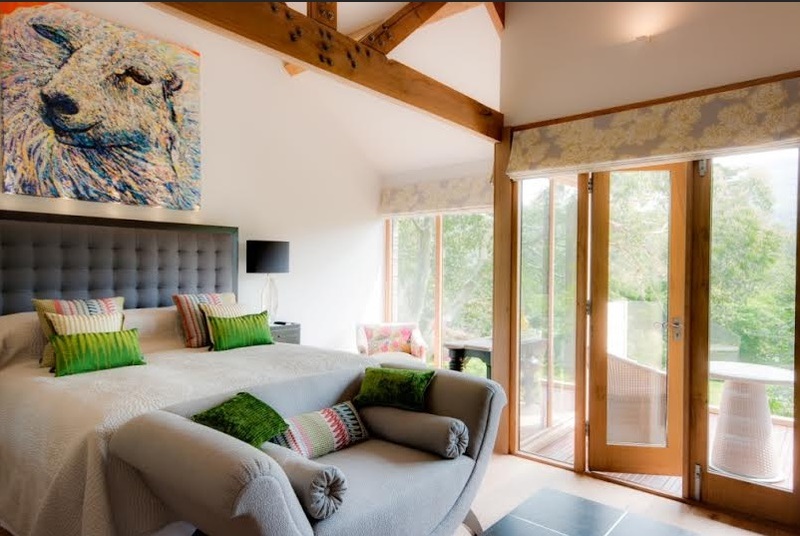 Have one of our stunning Garden Suites; arrive in time for an Afternoon tea. Turn off your phone, hide the I pad. Sit and admire the view. Feel the peace seep into your bones and the stress just melt away. Wander round the gardens and listen to the birdsong. Come to the cosy bar, have a glass of Champagne whilst you study the menu. Try our Market menu tonight, after indulging in the Afternoon tea. Enjoy the wonderful food, and admire the views and Rob’s vibrant paintings. Retire to your lovely room for a restful night’s sleep, lulled by the deep feather pillows, and the silence. After a wonderful breakfast, try a guided walk around the stunning Ynyshir RSPB Reserve, stop for a while in the hides and just let your mind drift away. Return for a snack, and then try a treatment with our magic Therapist, Thomas Buchi. His Bio Energy massage will complete your de stress! Rest and relax for a while, then come to enjoy a truly memorable meal. Go for Gareth’s amazing 11 course taste menu tonight, each mouthful an explosion of taste. Next morning, before you leave, you must visit the beautiful beach at Ynyslas. Whatever the weather, a walk on the wonderful beach, filling your lungs with fresh sea air. Leave feeling completely revitalised, and vowing to return. How important are architecture/design to the success of your hotel? The main house is a charming mix of many styles as it has grown through the centuries. It has a wonderful welcoming feel, it’s relatively small size makes it more like visiting someone’s very special home rather than being a ‘hotel’. The two newly built suites were a challenge. I was determined that they would be in keeping with the rest of the house, but didn’t want them to be a pastiche. We used a modern design, but used Welsh oak, slate and local stone. The décor was created to draw from the amazing views, picking the cerise from the huge rhododendron for one suite, and the greens of the eucalyptus and the lawns for the second. We even found a quarry on our own land to source the stone for the feature chimney breasts in each room. The décor in the main house is also very much our own, and based often around Rob’s paintings. So creates a very distinctive feel. All our marketing material is designed by us, the menus are handmade by Rob, we had a big input on the web design, and we write most of our publicity material. So we are the antithesis of corporate. The personal touch is really appreciated by the inveterate travellers, who find it quite refreshing. We have a small team, and we are really like a family. We have a great mix of ages and nationalities. We have regular staff meetings, and I encourage everyone’s contributions. Our style is very democratic. We always discuss successes and failures, and try to learn from every experience. This way the staff feel an ownership and are very involved. They rejoice at all our awards and feel proud. I rarely need to discipline as a mistake is hurtful to any staff member. We always choose new staff carefully, and move them on rapidly if they don’t fit in. We encourage staff to try our food, and everyone has a chance to come once for a complimentary meal. Then we offer staff rates of 50% for family members. They also can visit other Relais & Chateaux hotels in the UK for a very special rate. We encourage them to do so, as we can always learn from their experience. We can’t always compete with the larger hotels in terms of salary, but we do our best to have a happy team who enjoy their work. My Chef Gareth’s sourdough bread and Laurent Perrier Rose champagne. Shadow of the Wind, by Carlos Ruiz Zafon, The Interconnectedness of All Things, by John Gibson Forty. We have been fortunate to meet and become friends with many great hoteliers and chefs through the years, especially through our membership of Relais & Chateaux. I remember well attending our very first Relais & Chateaux Congress in St Petersburg, feeling rather overawed. The first person to come over to us and welcome us into the great family of Relais & Chateaux with a very French hug was Michel Roux senior, which put us at our ease immediately. As a lifelong fan, I have always admired the Roux brothers for bringing fine cuisine to the masses as one of the first celebrity TV Chefs. He and his family still dominate the scene, keeping the very highest standards over half a century, and have influenced countless new young chefs through the Roux Scholarships. On a personal level, my parents were my greatest role models. My mother was a college graduate and trained teacher, but my father had to leave school at 14. Together they created a fantastic business and ran it very successfully for 50 years. They made sure each of their four daughters had a university education, but most important, they instilled into all of us a work ethic that has stayed with us all our lives. I had no illusions about running my own business, as I knew first hand just how hard Mum and Dad had worked all their lives. Same as for the last 26 years, my Hotel. I live in the most beautiful place in the World, and quite honestly never want to be anywhere else! I love walking the local hills and beaches and never tire of their beauty. What's next for Ynyshir Hall Hotel? We have just completed a kitchen extension and complete refurbishment, and looking at the buoyancy of the bookings we intend to extend our dining rooms to capitalise on our investment there. The two new Garden Suites have been very popular, so we are now looking at building two more suites in the garden, possibly tree houses. The treatment rooms are also in demand, and we have more lovely old buildings around the court yard, which we plan to bring into use eventually, as sauna, yoga rooms etc. As I keep telling the staff, we have won so many Awards, now we have to keep them! You can never stand still.